German chancellor Angela Merkel lobbied hard for mass migration after it became clear in 2015 German industry could grind to a halt without a million-strong injection of cheap labour. But, as the young and ambitious next generation of wealth-creators headed from smaller, poorer states in the east to bigger wealthier nations like the Germany, France and the UK the countries they left behind were left facing economic hardship and financial ruin. Today Romania’s finance minister Eugen Teodorovici again blamed European Union’s unchecked migration policy for a crippling “brain drain” which was crushing his country’s ability to compete and called on the EU to end the brain drain. Express.co.uk highlighted this cruel spin-off of western nations taking eastern Europe’s brightest and best in a series of exclusive articles, written by reporter Zoie O’Brien. We are reprinting a key article below as it remains as relevant – perhaps more relevant – today as it was three years ago. It focuses on Albania – slated to become a member of the EU in 2020 – but the plight of that nation’s towns is mirrored across swathes of eastern Europe. ANGELA Merkel’s EU policy encouraging unchecked mass movement of young people from poor European areas to rich ones is creating GHOST TOWNS across the continent. The massive unchecked migration, encouraged by EU policies, is turning already financially weak nations into economic basket cases and leaving a glut of dying towns and villages populated only by old people. In Albania – which is tabled to become an EU member by 2020 – almost ALL young people dream of new lives in Britain or Germany. Many of them are already working here illegally. Germany in particular needs massive inward migration to keep its powerhouse economy moving and, as Express.co.uk reporter Zoie O’Brien discovered as she travelled in Albania, young Albanians are only to happy to provide that labour. But the knock-on effect is that their home nations are left with little or no young labour force to create the wealth for the next generation. The reality of this situation was made evident to our reporter triggering fears nations like Albania would never recover and have to be propped up by EU cash. Talks between the EU and Albania about the Balkan state joining are at an advanced stage after a meeting last night. Already thousands of Albanian nationals have flocked to the UK in search of better wages and living conditions, and the impact on their struggling economy is being felt across the nation. But, decision makers in Europe are taking their bid to join the union seriously, with some saying they could be a member state as soon as 2020. And thousands are counting on membership, so they can leave their homeland legally. Poverty in the country is described by its people as ‘catastrophic’ with huge numbers of unemployed young people. In the last six years, 30 per cent of the 3 million population has left the country and are living abroad. But the stats paint a false picture according to the younger members of society who admit they work illegally in Europe. And the authorities claim they have no idea how many have left illegally. Visa Llah, 17, dreams of working in the UK as his older brother does now. He said: “The young people here it is difficult for them to find a job. Some of them they just leave Albania and go to wherever they can find a little work. “My friends, they don’t earn anything. This is our chance to join Europe. We are really trying to get going in the union and really I want to join, I will enjoy it so much. “It will bring more money and more jobs here in Albania. My brother is in London. He really had good work, he is winning money and he really loves the UK. “My cousins, two of them, they went illegally to the UK and now they are trying to arrange their proper papers. “I try to pay attention in my studies and to learn English because it is the most important language in the world. I have lived in Italy for seven years and sometimes I return to Albania. A Government employee who did not wished to be named revealed the UK is the destination of choice for the young people, claiming thousands will head for Britain rather than easier to reach countries. He said: “The UK is heaven for Albanians. It is their favourite destination, who cares about Italy and Germany? The average earnings in Albania are €350 per month. But jobs are rare and rent can be expensive. One man told Express.co.uk he has no choice but to work in Italy for three months at a time. 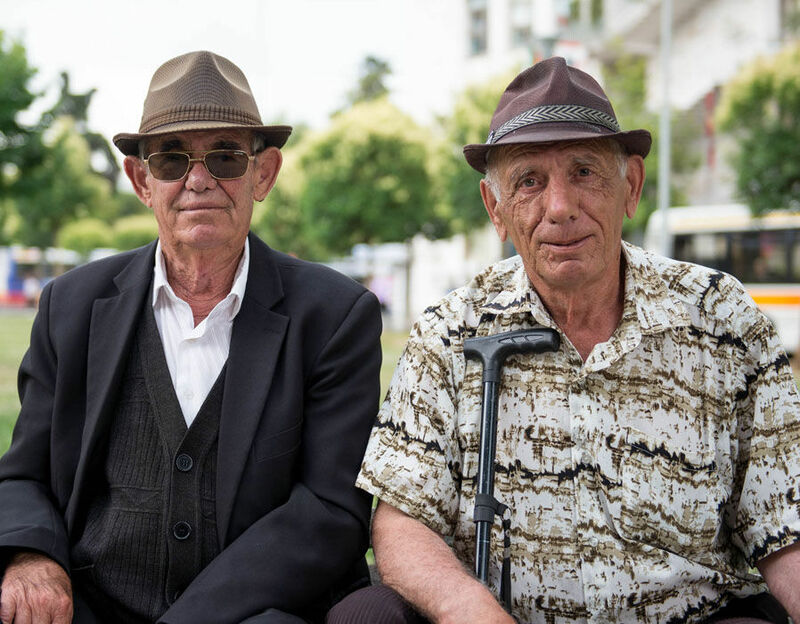 Besi, 28, said: “Young people in Albania are just drinking coffee every day. It is very difficult to find a job here. “If you don’t have friends with benefits, like business, it is very hard. So we go to Itlay and Germany to earn money and we come home. Albanians can visit EU countries without a visa for three months at a time legally, since they were given Schengen membership. But this does not entitle them to work. Arta, 33, who once lived with Albania’s many street families in ramshackle huts outside of the city centre, moved to Italy with her son for a new life. She said: “Everything is catastrophic. “There is no work. I live in Italy now, when I compare it, the situation here is devastating. Life is so difficult. In the north, communities have been badly affected by the Schengen Agreement, with most of their youth leaving completely. In the idyllic village of Novosej in the north of the country there are barely any young residents. It is a picture which is echoed across the country, with 30 per cent of the entire population leaving since Albania joined Schengen. A government source who did not want to be named said the Schengen Agreement has allowed young Albanians to travel abroad and work illegally. “They travel to Europe and work illegally. They are allowed to visit three months at a time, three times per year. Fiqiri Mici, 54, has had to let his two sons leave for work in Italy, and he does not think he will ever see them again. He said: “They had to leave, I had to let them go. “They have left and they never want to return. They have gone to Italy. Mr Mici was himself sent back after he was caught working illegally on a Schengen visa. He was one of thousands who rushed to Europe after his country was given Schengen membership. He said: “Now growing vegetables and my goats, they are my living, I consider them my business. At the SOS children’s village in Tirana up to 80 Children are being taken care of and educated, because their parents cannot afford to keep them, or have left them for work in the EU. The charity’s national director Teuta Shkenza said on a lot of occasions the children are left with poor relatives. She said: “Immigration is playing an important part right now. When democracy came a lot of people from the north came to Tirana because they thought now the could survive, or find a job. “Now the economic situation is causing some parents have abandoned their children completely to find work in Europe. “We had one family in the north they were boiling maize just to eat.